"What will Meghan Markle's wedding dress be like?" That's the question everyone has been asking ever since the couple confirmed their engagement last year. And this morning it was revealed that she has commissioned British designer Clare Waight Keller, the artistic director of Givenchy, to design a minimal, sleek wedding gown with a beautiful, sentimental sweeping veil. The dress is typical of a 1960s Givenchy wedding dress, as it has an open bateau neckline—Audrey Hepburn wore a similar style of neckline for her wedding dress in Funny Face. This sleek, clean gown is in keeping with the traditions of the house but also is modernized with three-quarter length sleeves and the choice of fabric. Kensington Palace says of the chosen silk, "Silk cady has a soft matt lustre whilst the bonding process and pure white colour chosen by Ms. Markle and Ms. Waight Keller bring a fresh modernity to the dress." As for her jewelry, the new Duchess of Sussex wore two beautiful pieces by Cartier. Specifically, she chose Galanterie de Cartier earrings with white gold and diamonds as well as a Reflection de Cartier bracelet with white gold and diamonds. The most special part of her wedding look is arguably the five meters long silk tulle veil, which nods to all of the 53 countries in the Commonwealth. The veil is covered in hand-embroidered flowers in silk threads and organza with one for each Commonwealth nation, and a full list of these 53 chosen flowers is listed on the Kensington Palace website. Prince Harry and Meghan Markle have chosen to focus most of their work on the Commonwealth and so her wedding look appropriately reflects her new public role. Kensington Palace says of this: "Each flower was worked flat, in three dimensions to create a unique and delicate design. The workers spent hundreds of hours meticulously sewing and washing their hands every thirty minutes to keep the tulle and threads pristine." She then added two flowers, which have a special personal significance–wintersweet, a flower which grows in Kensington Palace, and the California Poppy, which is the flower of where she grew up, California. The veil was held in place by a diamond bandeau tiara that was has a detachable brooch with 10 diamonds. This was lent to Meghan by the Queen, and it was made in 1932 for Queen Mary. As for her other accessories, Meghan wore a pair of pointed Givenchy shoes made with silk duchess satin in addition to her Cartier jewelry. Clare Waight Keller is the first female artistic director of Givenchy, and she said of the commission: "It is truly an honor to have been given the opportunity to closely collaborate with Meghan Markle on such a remarkable occasion. We wanted to create a timeless piece that would emphasize the iconic codes of Givenchy throughout its history, as well as convey modernity through sleek lines and sharp cuts. In contrast, the delicate floral beauty of the veil was a vision Meghan and I shared, a special gesture embracing the commonwealth flora, ascending the circumference of the silk tulle." "As a British designer at a Parisian Haute Couture house, and on behalf of all us at Givenchy who have been able to experience such an extraordinary process of creativity, I am extremely proud of what we have accomplished and grateful to Meghan Markle, Prince Harry and Kensington Palace for allowing us to be part of this historical chapter," adds Keller. "It has been an immensely rewarding experience to get to know Meghan on a personal level, one I will forever carry with me." So what is has been the reaction to her design? "Meghan's dress is incredibly theatrical and exquisitely cut with an embroidered cathedral-lengthhandmadee tulle veil," says Phillipa Lepley, couture wedding dress designer. "It is A-line with a relatively short train of about 70 inches from the waist, resulting in lovely movement as the bride walks. There are no seams in the bodice. Incredibly clean and plain dresses such as this are VERY time consuming and complicated to make, because unlike a lace dress, there is no room for any errors, and you can’t hide any wrinkles as the fabric has to sit perfectly." "When you have clean dress like that, the bride really shines," adds Lepley. "The neckline is lovely—the way the fabric is rolled, it is beautifully finished. There is very likely to be a hidden corset inside for support, and there is an invisible zip at the back. The overall look is very '50s and gorgeous!" Conversation has already turned to how Meghan is going to impact the decisions of other brides. 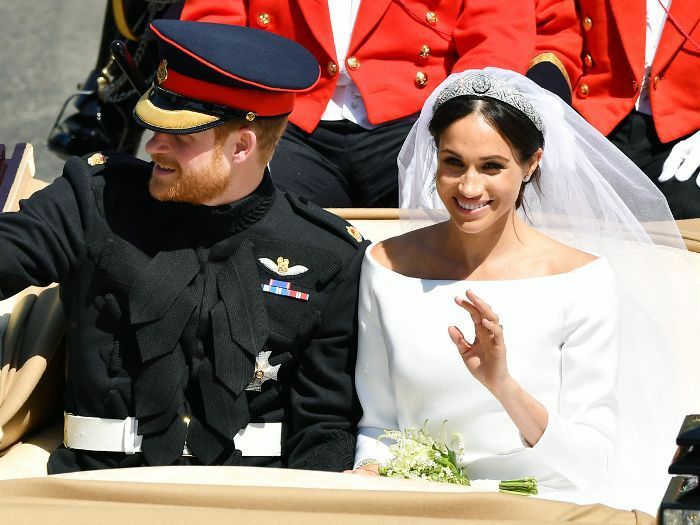 "We're thrilled to see Meghan embracing and leading a new trend in wedding dress style," say the experts at Bridebook. "Ever since Kate and William's weddings, lace has dominated wedding dresses in the UK, with 45% of UK brides wearing lace on their big day in 2017 and only 16% wearing satin or silk. In comparison Meghan's dress is striking, structural, demure and clean evoking a very traditional and reserved look that is still forward thinking and modern in style. Just as with Kate's influence, we are sure to see Meghan's dress completely transform the wedding dress styles for many years to come."